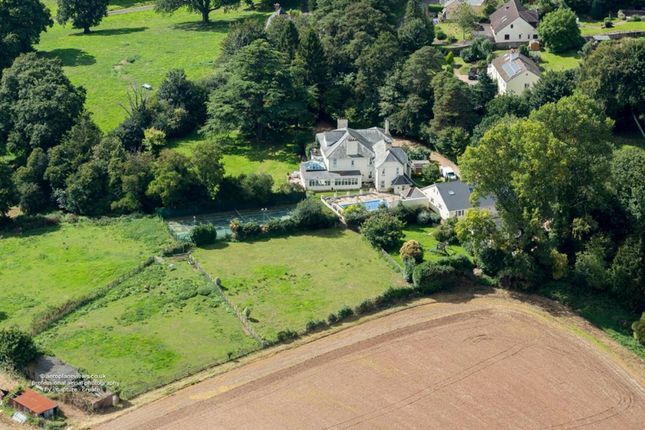 An outstanding private country house in superb Somerset location with easy access to major transport links, considerable ancillary accommodation, stables, paddock, tennis court, outdoor pool and recently constructed indoor swim spa and extensive countryside views all set in approximately 3.5 acres. The property benefits from seven bedrooms in the main house, (or five with attached two bedroom annex), detached single storey annex, coach house over large garage and ample off-road parking. This grand property has been fully refurbished and upgraded by the current owners to a high standard and benefits from high speed fibre optic cabling and occupies approximately 3.5 acres. The property can be split to create 2 residences along with the annexe and coach house it offers great income potential or multi -generational occupation. With feature fireplace, exposed wooden flooring, doors to three main reception rooms, inner hall to Utility and Cloakroom, doors to Kitchen and stairs rising. With feature open fireplace with wooden mantle and marble surround and hearth, large bay window to front. With large open fireplace with marble surround and mantle and polished granite hearth, large bay window too side overlooking lawn and patio. With feature open fireplace with marble surround and hearth and double panel-glazed doors to Garden Room. With wooden work surfaces with comprehensive range of storage cupboards and display shelving above and below, two ring extended Aga, matching island and breakfast bar with storage units and shelving below, arched entrance to further kitchen area with matching work surfaces with Belfast style sink unit inset, integrated four ring hob with extractor fan over, eye level grill/oven with further oven below, integrated dish washer, space for large fridge and freezer, fitted real wood flooring, doors to Garden Room and lobby leading to additional reception room or attached annexe. Leading to door to courtyard area and Utility Room with work surfaces and space and plumbing for washing machine window to side, oil fired central heating boiler, door to cloakroom with low level WC, window to rear and window to side. A light and spacious area with doors to all principle bedrooms and family bathroom, door leading to bedrooms five and six (or attached annexe), two large linen cupboards, large airing cupboard housing hot water cylinder, door to stairs leading to third floor, door to separate WC large picture window to gardens with views beyond. With windows overlooking the front of the house and wide opening to en-suite shower and bath room. With feature fireplace, double doors to balcony with superb extensive views beyond, door to en-suite. With vanity unit with twin sink units inset, walk in shower cubicle, low level WC. A double aspect room with feature fireplace and windows to both rear and side, both with superb views. With feature fireplace and window to rear overlooking pool with views beyond. Bedroom Five (currently utilised as an it Room and Hub) is accessed via stairs from the first floor landing and has a large dormer windows with extensive views beyond. There are a number of openings to storage and additional access to under eaves storage. With stairs to ground floor hall and reception room. Doors to Bathroom and Bedrooms six and seven, window to front, window to rear with extensive countryside views. With bathroom and Bedroom and six and Bedroom seven with en-suite shower room, which occupy north east wing of the property, this can be utilised either as part of the main house or as a separate annexe as there is a reception room and kitchen directly below. With built in wardrobe, feature fireplace and window to side. With walk in shower cubicle, low level WC, vanity unit with wash basin inset, window to gardens. With suite comprising panelled bath with shower attachment and shower screen over, low level WC, pedestal wash basin, good size airing cupboard, obscure glazed window to front. A light double aspect room with windows to both rear and side and door to en-suite. With walk in shower, low level WC, pedestal wash basin, obscure glazed window to side. With door to courtyard and door to further hallway with stairs rising to bedrooms six and seven and door to main landing of first floor, door to further reception room. With Ham Stone open fireplace with chimney breast recess storage cupboard, door to kitchen, double doors to rear patio and pool, window to side. A detached single storey dwelling benefitting from Entrance Hall with Storage cupboard and doors to Shower Room and good size Double Bedroom, lounge/diner with double doors to ramped access and small patio area, fully equipped Kitchen. The Annexe is light and spacious and bespoke, yet not limited to, persons of limited mobility. Located above the large store, the Coach House benefits from good size living accommodation and offers open plan living room/kitchen/diner (currently used as a leisure and games rooms), separate WC, double doors leading to large bedroom, good size storage cupboards and door to en-suite bathroom. Windows to rear with outstanding countryside views. The property is accessed via coded automatic gates leading to a gravelled drive that sweeps through to the main house and further to the detached garage/store and coach house above. The gravelled drive leads further beyond the garage giving access to the stables and paddock beyond. With automatic doors, ample space for a number of vehicles, light and power, attached good size storage area with boiler room. There are three good size stables and a tack room with hard standing yard, with water and electricity. The outdoor heated pool benefits from a changing/shower room, nearby hot tub, good size storage and pool room and surrounding paved patio areas. A fully enclosed well maintained Tennis Court with outstanding views occupies the western edge of the property. The surrounding grounds offer a large area laid to lawn, paddocks with their own water supply and stables. There are numerous fruit shrubs including raspberries, redcurrants, white currants, blackberries and mature fruit trees including a fig tree apple and plum. The whole enjoys a high degree of privacy with outstanding countryside views. There is potential to acquire further land, in doing so the property would lend itself to equestrian use.